Update (7.11.11 22:11): Updated the post with a link to the “ChiliProject – Spread the word” thread in the ChiliProject forums which holds most of the points I’ve dicussed at RailsCamp HH and the RUG::B.
I’ve been to two Ruby and Ruby on Rails focused events in the past week, first to the RailsCamp Hamburg 2011, then to the monthly meeting of the RUG::B (the Ruby User Group Berlin), and while I didn’t expect ChiliProject to be as well known as some other big or popular projects, I was somewhat astonished and maybe even a little disappointed to see how little even its name was known. It seems to me that public knowledge and being on people’s mind is something that we need to work on more than any technical or feature-wise improvements (don’t get me wrong: those are important too, but pretty useless if no one uses them…). It really hit me last saturday at the RailsCamp when the schedule for the day was being discussed. When it was my turn to propose my talk (I had naturally prepared a short one about ChiliProject and why we had forked Redmine), I first asked how many people had heard of ChiliProject, then how many didn’t know Redmine. I estimate there were some 100-130 people present, and the answer to both questions was less than ten. Now I didn’t expect more than half the people present to know about ChiliProject, but less than 10% is a really small mindshare. The interest wasn’t overwhelming either, but I credit that to my somewhat clumsy introduction to the matter and the very strong lineup otherwise than to sheer disinterest, so the talk turned into a discussion with people already using Redmine that have gone a little worried about the project and who were glad to hear about someone “picking up the slack”, even if it was in the form of a fork. Then came the RUG::B. I had planned on going anyway and decided to try to spread the word about ChiliProject there. I reworked the presentation to be more focused on the technical and community reasons behind the fork (the slides aren’t available online as some slides might be misinterpreted without the presentation, the gist of the presentation’s arguments can be found in this “ChiliProject – Spread the word” thread in the ChiliProject forums) and presented it to the 30-odd people present. The preliminary question got roughly the same answer as on the RailsCamp, the interest and response were great though, including specific questions regarding the intended “community management” style and praise and admiration for having the guts to fork instead of just “giving up”. Update (1.11.11 22:42): Jonas von den Ubernauten hat mich drauf hingewiesen, dass man schon mittels gitolite ein Repository über ssh mit mehreren Nutzern teilen kann, den Post habe ich entsprechend korrigiert. Weiterhin bietet grack keine wirklichen Vorteile gegenüber dem git-eigenen git-http-backend, den hatte ich allerdings “vergessen” weil er als ich auf einem anderen Server einen git smart-http installiert habe nicht in Frage gekommen war, grack schon. Kahlil Lechelt hat vor ein paar Monaten in seinem Post UberGit schon gezeigt, wie man Uberspace als privaten git Server über ssh benutzen kann. Diese Methode hat allerdings den Nachteil, dass man Anderen keinen Zugriff auf seine Repositories oder mehreren Leuten Schreibzugriff auf ein gemeinsam-genutztes Repository geben kann. Das Uberspace Wiki beschreibt weiterhin, wie man gitolite installieren kann und damit über ssh mehreren Nutzern Lese- und/oder Schreibzugriff auf Repositories geben kann, bzw. wie man ein Repository über http veröffentlichen kann, hier ist der Schreibzugriff allerdings ausgeschlossen. Nun, wem unwohl ist anderen Benutzern Zugriff auf sein ssh zu geben, die ssh-Konfiguration für die Endanwender zu kompliziert ist und über http auch schreiben können möchte, dem verschafft grack Abhilfe. grack ist ein in Ruby geschriebener Wrapper um git selbst, der einen git-smart-http-Server über den man Repositories lesen und schreiben kann bereitstellt. einen fcgi-Handler mit der richtigen ruby-Version und grack-Konfiguration für dich erstellt. Die durch das Skript erstellte Konfiguration erlaubt Lese- aber keinen Schreibzugriff, um Letzteren zu erlauben muss in der erstellten ~/fcgi-bin/git.fcgi der Parameter :receive_pack => false, zu :receive_pack => true, geändert werden. Das fcgi-Skript kann man auch nach Belieben in einen anderen Host als den default Host installieren, dafür verweise ich aber auf den FastCGI Artikel im Uberspace Wiki (dort ist übrigens auch beschrieben wie man ein FastCGI Skript neustarten kann, was nötig ist nachdem man die Konfiguration geändert hat). Repositories sollten für grack im bare Format vorliegen. Ein neues Repository legt man mit git init --bare ~/.grack/repositories/repo_name an, ein existierendes Repository kann man mit git clone --bare http://example.com/repo_name ~/.grack/repositories/repo_name clonen. Die Adresse zu einen so erstellten Repository lautet für mich dann http://thegcat.virgo.uberspace.de/fcgi-bin/git.fcgi/repo_name, den Account bzw. Uberhost Namen muss dann jeder für sich anpassen (das Skript gibt die “Oberadresse” für alle Repositories auch noch mal aus :–) ). Eine letzte aber wichtige Anmerkung: grack bietet keine Möglichkeit den Zugriff auf alle oder einzelne Repositories zu verbieten bzw. nur bestimmten Benutzern zu erlauben, man kann lediglich über die Parameter :upload_pack bzw. :receive_pack Lese- bzw. Schreib-Operationen für alle Repositories zulassen. Eine feinere Zugangskontrolle muss noch “vor” grack im Uberhost Apache passieren, dazu aber später von den Ubernauten oder mir noch was. echo "You already have a git.fcgi in your ~/fcgi-bin. Nothing to do here." echo "You already have a ~/.grack directory. Nothing to do here." echo "You have now installed grack to your uberspace"
echo "You can now create (or clone) bare repositories in"
echo "those will be made available under"
echo "Please note that repositories published that way are world-readable!" tl;dr: Draper wraps the Rails “helper dumps” in objects resulting in namespaced dumps you have to remember calling. Yay (not). Disclaimer: I’m no expert on OOP (apart from the basic class at the university that teaches that “putting code in classes” is good) nor Rails (I learnt ruby and Rails by myself roughly 2 years ago while tinkering with Redmine (hint: not the nicest code in the Rails world)), so don’t take my opinion for granted, I just hope to fuel the discussion a little. Flashback to pre-Draper times: everyone has a feeling of sorts that the Rails helpers are probably a bad idea, but they still become the dumping place for any formatting methods and other stuff you don’t know where else to put. Formatting methods landed there because having them in your ActiveRecord models made the models look bloated which made you feel even worse than putting them in the helpers and/or because what you wanted the method do do wouldn’t work in the model because models miss the ActionView helpers (link_to et al.). Over time, the helpers would get bloated, you’d have to add them to an increasing number of views, maybe even include them in the controllers because you’d put some controller logic in there or needed view logic in the controller (I’m looking at you, #to_xml, but that’s a different matter). In the end, everyone would feel bad about the helpers becoming so big and jumbled together, but it still was better than having all this stuff in your models or controllers (or views!) and more convenient because you could even add all helpers to all view and be done with it (provided you didn’t have any methods with the same names in different helpers). Enter Draper. It has a nice sounding name, claims to solve an itch Rails developers have, and uses a catchy sounding OOP pattern everyone has heard about some time or another as selling point. Problem solved, right? I thought so too at first (beware of the buzzwords! 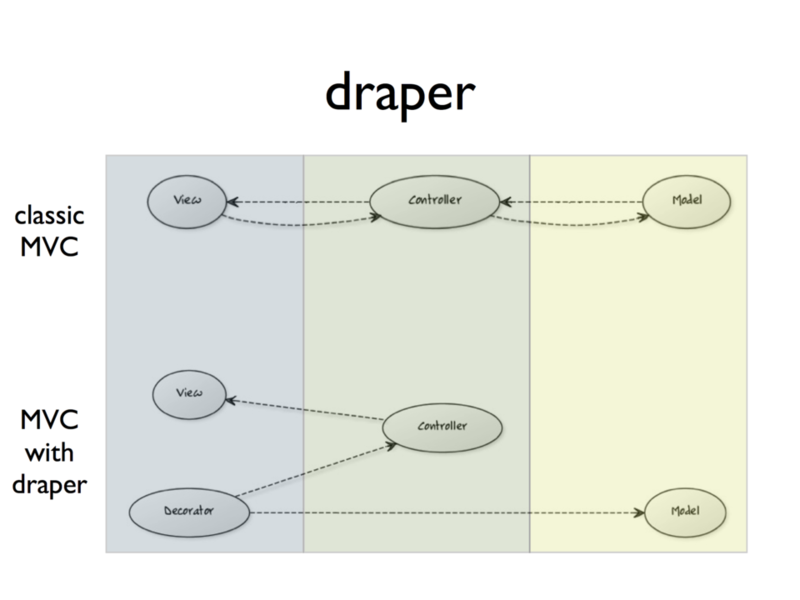 ), but Andreas (@mediafinger) and Uygar’s (@uygar_gg) presentation at the RailsCamp Hamburg made me realize that the lurking unease I had about Draper is justified after all. Draper just wraps your helpers in objects (something you could have easily done before but rightfully didn’t) thus solving the cross-helper method name collision problem, at the cost of just a little less hassle than doing it yourself would have been while masking the pain you’d have had making decorators yourself. Not really pretty because you have some function twitter_link_for_user that looks like it should rather belong to the User class (the for_user part of the method name should be enough of a hint) rather than lurch in the helper, and you have included the helper in the controller, for example to include the twitter link in some #to_xml call. If I’m not completely mistaken, Rails helpers are view helpers, including them in your controllers puts view logic in them, which kinda renders the whole MVC pattern moot and should be considered a code smell. You can now get the twitter link for the user by calling @user.twitter_link and you were able to stop including the helper in the controller, you can even drop the helper call in the controller if your helper becomes empty. You feel all fuzzy inside and are comfortable with your code again. The helper is empty and everything is neatly organized in objects, so it’s all OOP and must thus be good, right? I don’t think so. Now if you applied the decorator to your object only “after” the controller, I wouldn’t mind (provided said decorator contains view logic only). Sadly, that’s not the case in the code examples provided by Draper. The approach presented above has more pitfalls still, and one that isn’t apparent from the code above is that you’re working on “fully” decorated objects in the controller. Apart from bringing view logic into your controller, this also is problematic with another feature of Draper which allows to white- or blacklist functions of the decorated object. Great feature, you decide to blacklist write operations to your object, including save, but that means for “write” actions (create and update) you can’t use the decorated object in your controller logic. No big deal, you just use the plain object and decorate only if the operation fails and you have to present the user with the form for the object (this would be the right way to apply view decorators, by the way). Now for whatever reason, for example for access control, you stick a method into your decorator (it’s only of interest to instances of that particular class but isn’t business logic, so you don’t put it in the helper nor in the object but into the decorator) and now need the decorated object before you call save on it. You now have to juggle a decorated and an undecorated instance of the object at the same time. Bummer. Let’s recap what bothers us with the Rails helpers and what Draper can do for us. Does it avoid cross-helper method name collisions? Sure. Is it “more OOP”? You’re explicitly calling your helper methods on an object rather than including a misnamed hodgepodge of methods to be able to call them in views, so let’s say yes here too. Does it take this jumbled together mess out of the helpers? It does, and sticks this same mess but with better names into an object. I don’t consider a namespaced mess better than a non-namespaced one, so this is a draw. Does it keep view logic out of your controllers? Nope, I’d even say it makes things worse. Does it keep view logic out of your models? Yeah, but so do helpers. Does Draper give us more than a buzzword we can add to the list of “OOP things” our code does? I don’t think so, and you probably shouldn’t either. I’m at that point again. Relaunching the blog. New theme, new engine, hopefully more content, probably more technical content, probably more english than german, new address. More of a fresh start with imported history than a continuation really. Blogging didn’t really work for me in the past. I don’t know if it was because of the engine (wordpress), because I didn’t think I have enough interesting things to share, or that the idea-to-blog hurdle is higher than just ranting on twitter (I still do that, by the way…), but I tried twice in the past and it didn’t stick. Some rare posts about being one of two remote employees in an otherwise one-office software development shop. 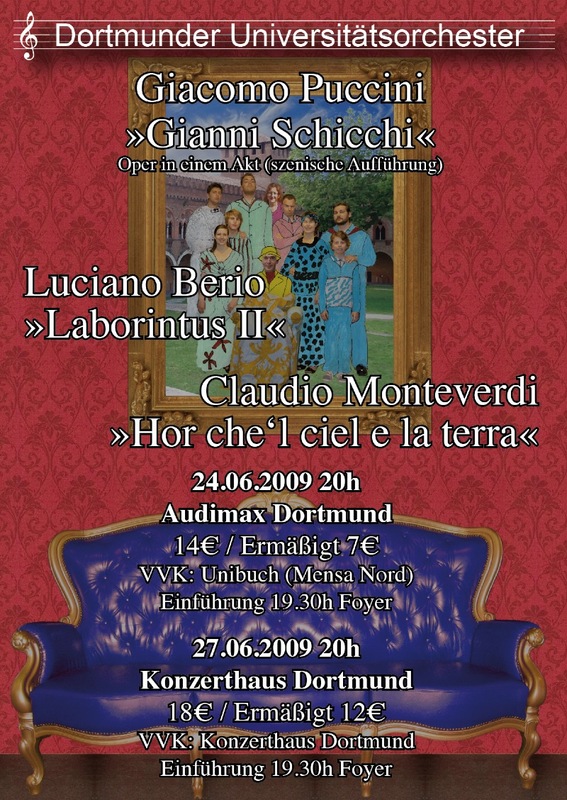 Nachtrag (15.06.09 12:10): Mehr Infos gibt es auch noch auf den Seiten der Fakultat für Kunst- und Sportwissenschaften der TU Dortmund: Italienisches Triptychon im Juni. Sitzprobe Zu Gianni Schicchi Erfolgreich! Kurz vorweg: Eine Sitzprobe ist eine Probe mit allen musikalisch an einer Oper beteiligten Personen, meistens Orchester samt Dirigent und Sänger, gegebenenfalls auch Chor. 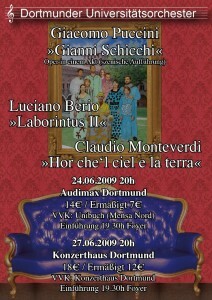 Wir, also die Gianni Schicchi “Crew”, hatten also heute unsere erste und leider auch letzte Sitzprobe. Es ist leider aus verschiedenen organisatorischen und persönlichen Gründen früher, öfter oder mit wirklich allen (es gab sowohl im Orchester als auch bei den Sängern leere Stühle) zu proben. Ich hätte mir für diese Oper auch ein paar mehr gemeinsame Proben gewünscht, weil es eine musikalisch sehr anspruchsvolle Oper ist, und sowohl das Orchester als auch die Sänger größtenteils aus “Amateuren” (In dem Sinne, dass nur wenige diese Tätigkeit aktuell lernt oder gar beruflich ausübt) bestehen. Nichtsdestotrotz haben wir versucht aus der heutigen Probe das Beste zu holen, und ich denke, dass es uns gelungen ist! Musikalisch hat also alles gepasst, oder zumindest gab es keine gravierenden Probleme, die nicht in der nächsten Woche noch beseitigt werden könnten. Mal sehen, wie das wird, wenn wir noch die Szene einbringen! Das wird allerdings erst am 16.06. bei der Generalprobe stattfinden (wer mal in eine Generalprobe reinschauen will kann sicher kommen, wenn nicht zu viele andere die gleiche Idee haben, gegebenenfalls ganz unten auf “Kontakt” klicken und mir eine Mail schreiben), und da wird sicherlich noch einiges schief gehen (bei einer Generalprobe passiert immer etwas). Irgendwie ist heute mal wieder ein Tag mit schlechten Gewissem: Egal was ich mache, ich werde ein schlechtes Gewissen haben… Morgen haben wir mit der Operntruppe unsere erste, und leider auch letzte, Sitzprobe mit dem Orchester, und dafür sollte ich noch etwas üben. Dazu hätte ich heute sogar Zeit, allerdings würden mein Hals und meine Stimme mir das wahrscheinlich nachhalten, weil ich gerade noch etwas erkältet bin, und zusätzlich zur Probe morgen heute noch ein Konzert habe. Ich kann mir also aussuchen mich zu ärgern, weil ich nicht geübt habe, oder weil ich mir für die nächsten paar Tage die Stimme versinge, tolle Wurst :-? Student. Ruby on Rails and Redmine specialist at Planio. Contact me via e-mail, ping me on Twitter or find me on G+.